Mortgage Rates Hit New Record Low: Where Are They Going Next? 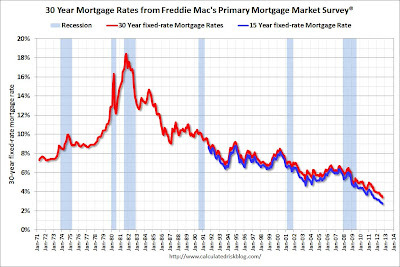 Mortgage rates just touched down this week at new all time record lows as reported by Freddie Mac at 3.40%. How much lower can mortgage rates fall? Much lower. The chart below shows the incredible (record) spread between the interest rates where mortgages are being sold at to home buyers compared to what they are being purchased at in the secondary market by banks, institutions, etc. 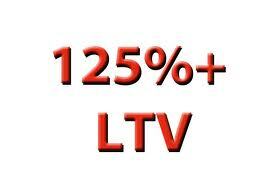 through mortgage backed securities (1.70%). Owners of these mortgage backed securities have the ability to pocket this "spread" creating huge profit windfalls for the banks. How did this spread occur? The demand for new mortgages and refinances has been so great as mortgage rates continue to fall that banks cannot keep up with the orders. Even if they could keep up with the orders, they are dragging their feet in order to slow down the amount rates can fall over the short term for consumers. "Think about it this way: If you had a restaurant with 100 people out the door waiting in line, would lowering prices be the first thing on your mind?" What does this mean if you are a buyer or someone looking to re-finance in the short term? Wait. More competitors will enter the market to take up the massive demand. The spread seen in the chart above will contract to the downside (unless of course the bond market finally implodes, which it could at any moment). I joked years ago that the Fed would try to artificially bring rates down to 2% to raise home prices, something that seemed completely impossible at the time. We may now only be weeks away from that point. Ultimately this story will end in disaster. Incredible interview with someone who does not usually get "mainstream" time; billionaire hedge fund manager Eric Sprott. Sprott's fund, which has over $10 billion under management, maintains over 80% of the fund in precious metals and mining shares. I read and listen to just about every piece of information Sprott makes available, and I believe when we reach the endgame he will be one of the most wealthy men in the world (his personal portfolio which is over $1 billion in size is heavily concentrated in precious metals and mining stocks). After the European Central Bank promised to purchase an "unlimited" amount of sovereign debt when a country gets down on its knees and asks for a bailout, things have calmed significantly in the financial markets. The interest rates on Spanish government bonds have fallen. This has created a strange situation because with rates now lower the government is saying that it will not need a bail out. 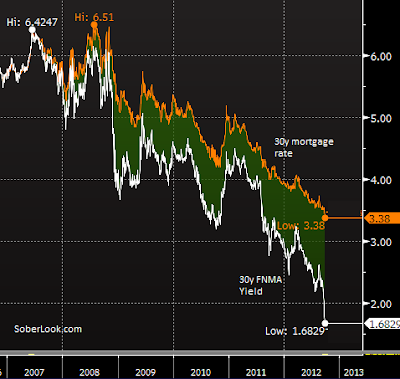 But the only reason rates are lower is because the market priced in a bail out and the unlimited ECB support. The government knows that "support" will come with pressure to cut spending so they are dragging their feet as much as possible. How this will be resolved will not be a happy ending (rates surging again, Spain asking for bailout, spending cut, and the economy shrinking). Meanwhile, have things actually been fixed in Spain as the bond market (and American stock market) has priced in? The best thing to do is check in with the day to day action on the streets of Spain. 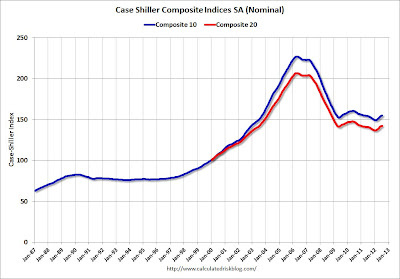 All 20 cities tracked in the Case-Shiller home price index rose for the third consecutive month. The following shows the city by city breakdown. Every months that home prices rise it helps the millions of homeowners who continue to be trapped under water. 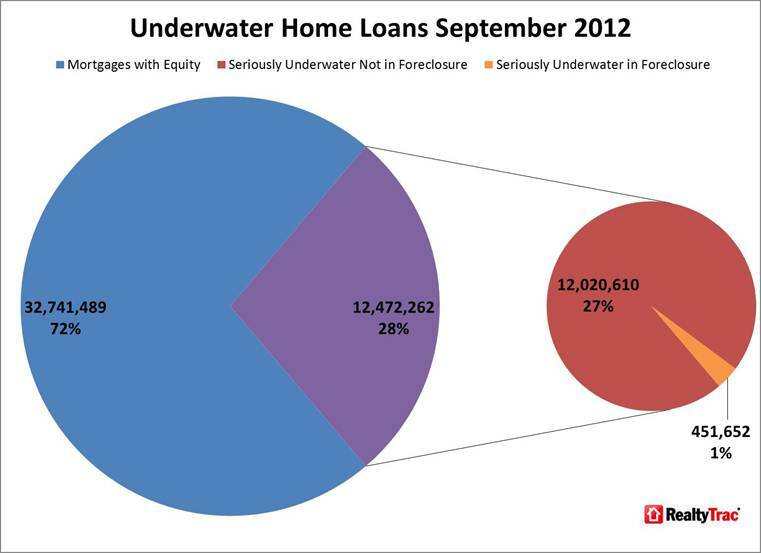 There are currently 12,472,262 mortgages under water or 28% of all mortgages in the country. Of this number only 451,652 are in foreclosure. This means the other 96% of the mortgages underwater continue to make their payment every month in hopes prices will continue to rise (or they are living payment free while the bank just holds their loan in the shadow inventory). The race is now on for Bernanke and the federal government to get these loans back above water before the rest of the 96% realize that it makes no sense to continue to make payments. They are working very hard to accomplish just that. The federal government (the tax payer) is currently purchasing, guaranteeing, or insuring 97% of every new mortgage created. Nope. The Federal Reserve, after last week's QE-to-Infinity announcement, is now purchasing every government sponsored loan with printed money. Forever. The goal is to give every possible borrower in the country the chance to over pay for their monthly cost of living through home ownership like they did in 2003 - 2006. Rather than let home prices fall and let every American enjoy this savings on their cost of living, they want this cost to surge. After all, the interest payments are now just going to the government and the Federal Reserve - which is a privately owned bank. After they try to get interest rates down as close as possible to 0%, they will then offer 100% financing, then maybe even 125% financing as was offered during the peak of the subprime mania. If that does not get every mortgage back above water the government will probably start offering cars, televisions, and 6 month paid vacations to go with the 125% loans (the extra 25% you just take home as cash with 0% interest). They may very well succeed. Maybe they can get home prices up another 30%. Gold owners will watch their portfolios rise at least 500% in comparison, as we sit back and enjoy the complete insanity from the sidelines. 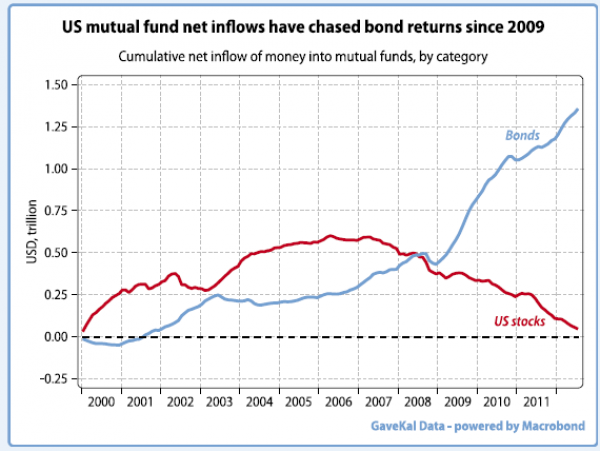 The following chart shows the mutual fund inflows out of stocks (red line) and into bonds (blue line). This shows that the average American through their 401k has been piling into bonds at an almost unrelenting rate over the past four years. The correct answer is "prices will fall." What percentage of respondents knew the answer? 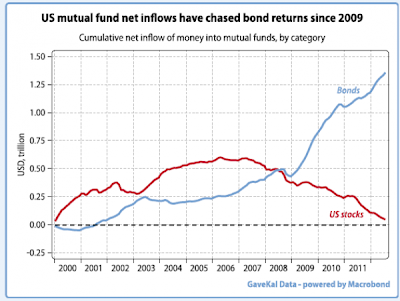 Americans right now are piling into bond funds at their highest price in history. 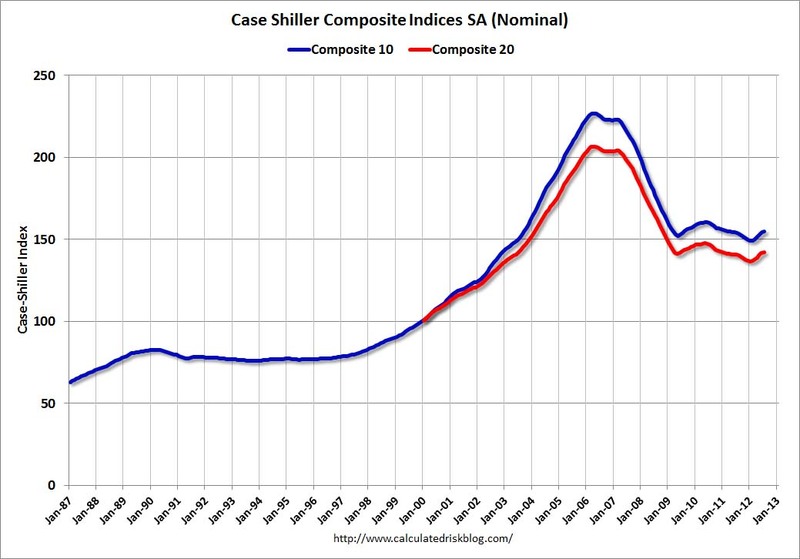 It is the exact equivalent of piling into stocks in 2000 and real estate in 2005. In all bubbles in the past Americans knew subconsciously the danger they took in purchasing an investment. It was clearly obvious that if prices fell in either stocks or real estate then they would lose money. They just disregarded the notion because they were caught up in the manic psychology. This time it goes even beyond that. Not only are investors piling into bonds at the peak of the mania, but they don't even know that prices can fall. They think of a bond as the equivalent of cash. Ask some people you know what they think would happen to a bond they hold if rates were to double. I bet almost all of them have no idea. I wanted to take a moment, as I do from time to time, to thank all the readers that continue to visit and read the site here. I have a business that I own and run in Charlotte, NC that is my primary "job," and this website is something that I do just because I enjoy doing it. Because I stay very busy through the week and even on the weekends I am unable to post articles every day. I do spend a lot of time every day reading and taking in a tremendous amount of information on the markets. I will continue to post the best articles and the best videos/audio interviews I come across every day on the pages at the top titled "Today's News" and "Today's Video & Media." 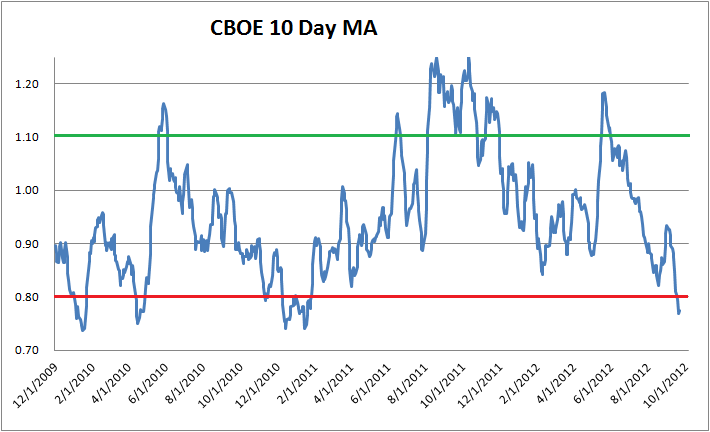 This will give the market junkies (like me) something they can have on a daily basis. I, of course, will continue to provide as much of my personal thoughts on the world as possible and anytime someone has questions or wants to discuss a topic further please continue to communicate through the comments sections of the articles. This site started in August of 2008 and through the entire 2008 year there were a total of about 3,000 page views. The site is now receiving around 30,000 page views per month and it is closing in on the half a million total view count. It has been pretty amazing to watch it continue to grow. Thanks again, and I look forward to the excitement ahead. I think the next four years will be far more turbulent than the last. US Stock Market Sentiment & Prices Soar: Shorting Opportunity? Earlier in the week we took a look at the falling share prices and extreme pessimism in the Chinese stock market in China's Stock Market Continues To Plunge: Buying Opportunity? Today we look at the mirror image of what has been taking place in China - the US stock market. Up until recently the stock markets around the world were trading in lock step, a phenomenon known as correlation. Then in late 2009, seen in the graph below, the US market (S&P 500) began to diverge from Europe and China. These three regions represent the three largest pillars of the global economy. Those living in America have hardly noticed that the rest of the world has been deteriorating significantly over the last few years. 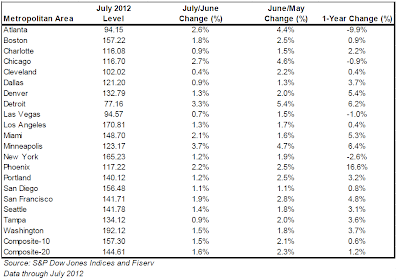 They turn on the news, see the market went up that day, and assume that the global recovery is moving right on schedule. 1. The American economy is recovering much better than the rest of the world and stocks represent this strength. 2. The global economy is doing much better than the non-American markets represent and they should soon catch up with the American stocks. 3. The American economy is drastically overpriced in relation to what is actually taking place in the world. I believe the answer is number 3. The global economy continues to contract and in some areas it is contracting rapidly. So what ultimately has created this gap? I have discussed many times in the past that money moves around the world, sloshing in different areas, in a borderless fashion based on numerous factors. Over the past two and a half years money has essentially been leaving the Eurozone in a non-stop relentless manner. Investors, businesses, banks, money markets, and even individuals have looked around at what is happening and they have sold both their bonds and stocks. They have even moved their cash. This money has needed a new home. A large portion of this capital moved toward the United States. This is clearly represented in the tri-fecta strength of the US currency (the dollar), US stocks, and all US bond markets. The same process has been taking place in China, although at a much slower pace, as their economy slows down and their real estate bubble begins to deflate. What has this done? Created the false impression that the US is somehow immune from the global economy slow down. These same arguments were given back in late 2008 when analysts said that the rest of world would not be impacted by the US subprime crisis. This false impression has led to euphoria in the US markets. Sentiment indicators are once again moving to extreme levels across the board. 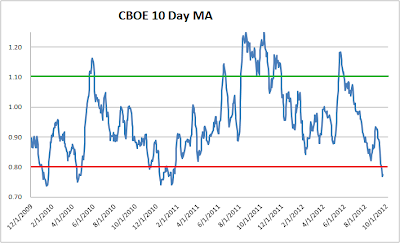 The CBOE put/call ratio is now at the lowest point in over one and a half years. This means that investors are buying options (calls) that stocks will go higher. Essentially betting, with leverage, on higher prices. 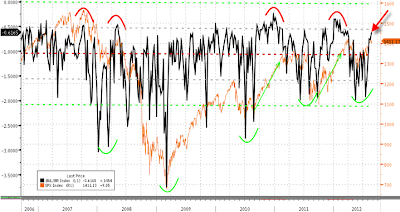 The Market Vane bullish consensus index is now higher than it was at the absolute high of the stock market back in 2007. It has crossed above 70% into the danger zone. 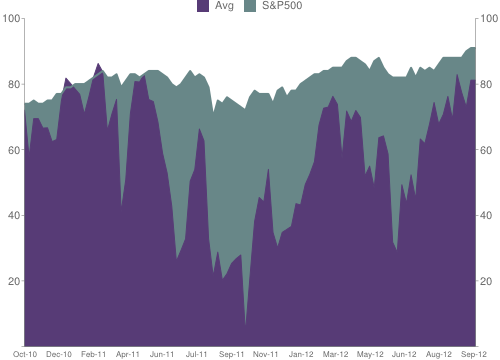 The NAAIM survey of manager sentiment has crossed back above 80; the opposite of what was seen during the September 2011 and June 2012 temporary bottoms in the market. The AAII bull/bear ratio is rising rapidly toward recent extreme highs. This means there are far more bulls betting on higher prices. Earlier in the week I made the case that select Chinese stocks were at attractive purchasing levels. 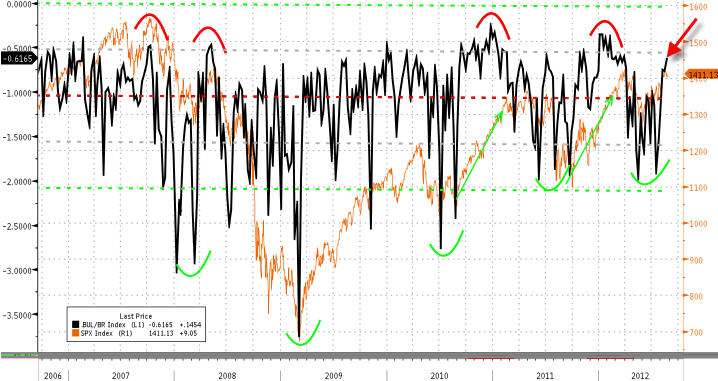 I also believe that select US stocks are now at attractive shorting levels (betting on prices falling). 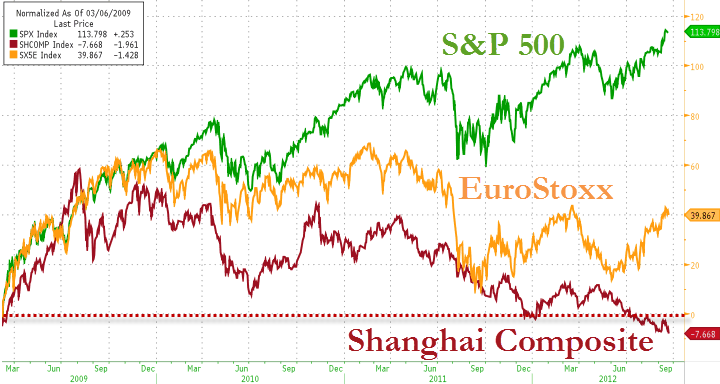 If I were managing a portfolio I would have a percentage long China and a percentage short America. However, if you believe either scenario 1 or 2 above represent the reason for the markets to be behaving the way that they are then this is an incorrect strategy. Moving forward I will continue to discuss why the global economy will continue to contract even though Americans can only see higher stock prices which falsely justify a recovery that does not exist. For a discussion on how the recently announced "QE To Infinity" program relates to stock market prices see The Dark Side Of QE: The Next Chapter In Our Story.